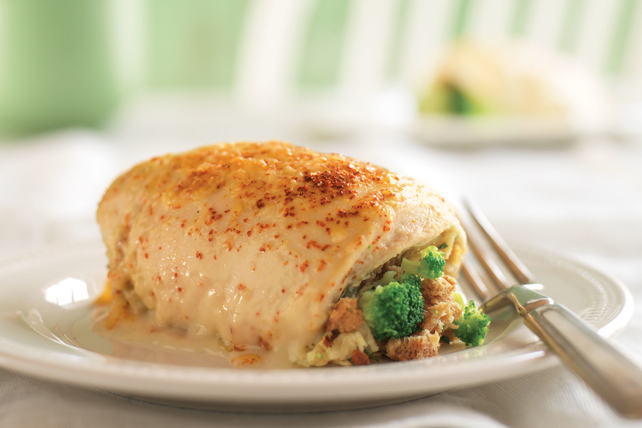 Say hello to these Creamy Broccoli-Stuffed Chicken Breasts! Bonus: These Creamy Broccoli-Stuffed Chicken Breasts can fit into your smart eating plan. Combine stuffing mix and water in large bowl. Let stand 5 min. Meanwhile, pound chicken to 1/4-inch thickness. Add broccoli to stuffing; mix lightly. Spread onto chicken to within 1/2 inch of edges; roll up starting at one short end of each. Place, seam-sides down, in 13x9-inch baking dish. Mix soup and milk; pour over chicken. Top with paprika and cheese. Prepare using 98% fat-free condensed cream of mushroom soup.